I have written a report on Cardinal Raymond Burke's visit to the United Kingdom which can be read at The Guild of Blessed Titus Brandsma. No interview, sadly, but good things come to those who wait. Once more I make an appeal to Catholic bloggers faithful to the Magisterium of Holy Mother Church to join this Guild of bloggers if you have not done so. We are stronger together. So I missed out on Cardinal Tagle's visit. God bless all readers and keep His Eminence in your prayers as well as Voice of the Family, the coalition of pro-life groups, among whom are SPUC, who kindly organised taking the voice of those now on the peripheries in the Church to the Synod in 2014, who will be there in October, as well as Cardinal Raymond Burke's talks in the United Kingdom. May God bless them in their work for Christ and His Church and keep this holy Cardinal safe and supported in His love. May God also bless abundantly the kind people I met both in Chester and in New Brighton who took time to show me kindness and make known their appreciation for this blog. It is nice to know I have new friends to call up North when I am next there. I even got a free lift to New Brighton thanks to a wonderful family. Blogging for Jesus is its own reward. If you know nothing about the mayhem that was released at last year's Synod then getting yourself familiar with it, as a Catholic, is an urgent priority. Fully warned is fully armed. Read the Voice of the Family's comprehensive report on the Synod here. You missed Timothy Radcliffe at Flame2 as well. Be brave. 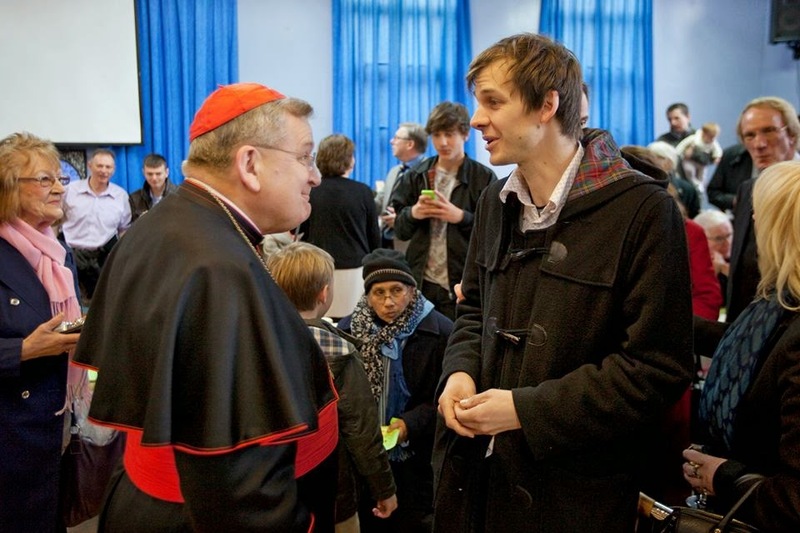 Tell me please Bones that you gave the good Cardinal Burke a signed copy of your 'Pope Francis Little Book of Insults'! So good to meet you Lawrence and your lovely wife. Do come and visit us again soon. Oh yes, bet he'd enjoy that! "faithful to the Magisterium of Holy Mother Church." I have to ask, honestly - which Magisterium? The Ordinary and Universay Magisterium of the Holy See is binding. Therefore, if the 'Holy See' that brought us the contradictions of VII and the Novus Ordo had Magisterial authority - then choose your contradictions. Would be happy for someone to come up with any info that says 'hands down' Popes, their public preaching and solemn public acts, their Encyclicals and the Councils they call don't comprise the Magisterium?